Since 1974, The Fabulous Hubcaps have been bringing young and old alike a taste of the American Music Scene from the 50’s through the 70’s. The Hubcap’s flair for capturing the true likeness of the original artist will amaze you. Their costumed impersonations of some of the greatest legends of Rock and Roll will take you on a musical journey you won’t forget. On any given night, you may see the likes of Elvis, Little Richard, The Beach Boys, Tina Turner, The Platters, Ray Charles, Frank Sinatra, and many more artists too numerous to mention. 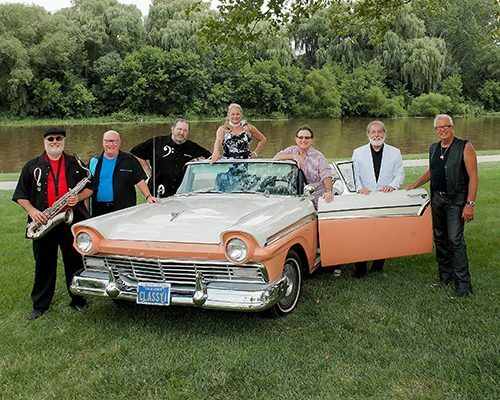 The Hubcaps are high-energy personified as their shows take them all over the country from venues as diverse as The White House, national conventions, theatres, casinos, corporate events and many state fairs and festivals. Inducted into the Southern Legends Performing Arts Hall of Fame, the Maryland Entertainment Hall of Fame, and named the 2015 Vocal Group of the Year by the Maryland Entertainment Hall of Fame, The Fabulous Hubcaps are thrilled and honored to be returning to the Rehoboth Bandstand. We’re looking forward to great time and hope you’ll join us!